West Plains Council on the Arts (WPCA) will host an exhibition of works by artist Kathryn Fisher entitled “A Year in the Ozarks” at the Gallery at the Center, West Plains Civic Center from January 21 through February 10, 2019. The Gallery, on the mezzanine, is open to the public during regular Civic Center hours. After thirty years as a successful textile artist, Kathryn Fisher shifted from painting with thickened dye on cotton cloth to painting in oil paint on linen canvas. Her work is usually impressionistic with a lean toward expressionism, although she sometimes paints in other styles as well. She has studied with notable artists such as Carolyn Anderson, Laura Robb, Quang Ho, C.W. Mundy, Matt Smith and T. Allen Lawson. Her work encompasses landscapes, animals, still life and figurative paintings. She accepts commissions for paintings as well. Her purpose is to see beauty even in unexpected places and to bring the viewer the joy that she found in the moment. She is a member of the American Impressionist Society. Fisher’s recent awards received from juried shows include Illinois River Salon 2017, Award of Merit; Illinois River Salon 2016, Best in Show; and Hoosier Salon, 2015 Field to Finish Award. 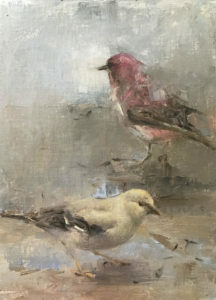 She was juried into the American Impressionist Society, 2016, First Annual “Impressions Small Works Showcase”. WPCA will host an Exhibit Reception on Saturday, January 26, from 2-4 p.m., in the Gallery at the Center. All are invited to attend, view and discuss these wonderful pieces. The exhibit is co-sponsored by the West Plains Civic Center and West Plains Council on the Arts, with partial funding provided by Missouri Arts Council, a state agency.